Caption Slip reads: "Photographer: Snow. Date: 1957-07-27. Reporter: Thackrey. Assignment: Northridge Stampede. 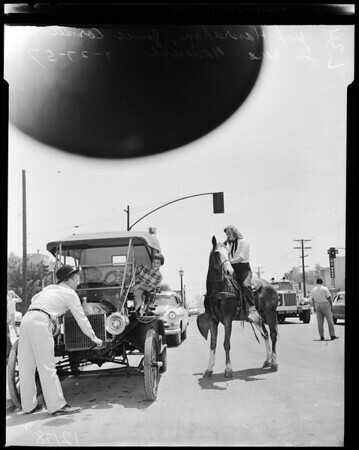 33-34, Horseless carriage owner Jack Hanrahan, 13346 Burbank boulevard Northridge, gets the horse laugh from Janice Cornett, 18210 Strathern Reseda. Both appeared in the parade opening the Northridge Stampede. In the car is Hanrahan's neice, Marianne White, of Chicago. 71 & 72 general view of stampede. 80-81: Ferris wheel. Mollie Sue Sanders, 5, and her sis, Elizabeth, 2, stroke the Civic Association goat. They are daughters of Mr. and Mrs. Jal Sanders, 8932 Canby, Northridge. Goat, loaned to the Civic association for the Stampede, is owned by Lawrence King."